The undoubted highlight of this extraordinary holiday will be a seven-night cruise on board a superbly appointed, five-star cruise ship of Holland America Line. Board the ship in Vancouver after a journey through the Rocky Mountains, sailing through the fabled ‘Inside Passage’ to wild, remote Alaska, calling at Glacier Bay, a UNESCO-World Heritage gateway to one of North America’s last great wildernesses, before the thoroughly enthralling tour is completed with a three-night stay in glittering Vancouver. Dates and prices published on this page are for the departures flying from Aberdeen, Edinburgh & Glasgow only. Fly direct to Calgary, home to the famous ‘Stampede’, and continue on into the majestic Rockies, to Banff, for a two-night stay. Join the optional guided tour this morning and explore Banff, undisputed ‘capital’ of the Rockies. Take in Surprise Corner for exquisite views of the iconic Banff Springs Hotel and venture to the summit of Sulphur Mountain by cable car. In the afternoon, perhaps join our exhilarating helicopter flight over the mountains. Today we’ll call at beautiful Lake Louise, where turquoise waters – frozen for much of the year – are set against the awesome backdrop of the Victoria Glacier. We’ll then travel the renowned Icefields Parkway – a spectacular journey through the heart of the Rockies – before continuing to Jasper, in scenic Jasper National Park. Your wonderful journey west continues, past majestic Mount Robson – the highest point in the Rockies – to the mountain resort of Sun Peaks and another overnight stay. Descending through the Coastal Ranges towards the Pacific and the beautiful city of Vancouver, board your ship for a late afternoon sailing into the Inside Passage and the wilderness State of Alaska, and settle into your cabin – your home for the next seven nights. As we cruise north, through the scenic Inside Passage, you can relax and enjoy the ship’s vast range of facilities and dining opportunities. Today we’ll make an afternoon and evening call at the Alaskan capital, Juneau, in its awe-inspiring setting at the foot of the magnificent mountains from which the immense Mendenhall Glacier flows. Optional shore excursions today will include tours and exhilarating activities such as kayaking or dogsledding. Enjoy a full day at Skagway, northernmost point of the cruise and our last stop before the Yukon. Part of the setting for Jack London’s iconic book ‘The Call of the Wild’, Skagway is still a pioneering town of honky-tonk saloons and Klondike memorabilia. 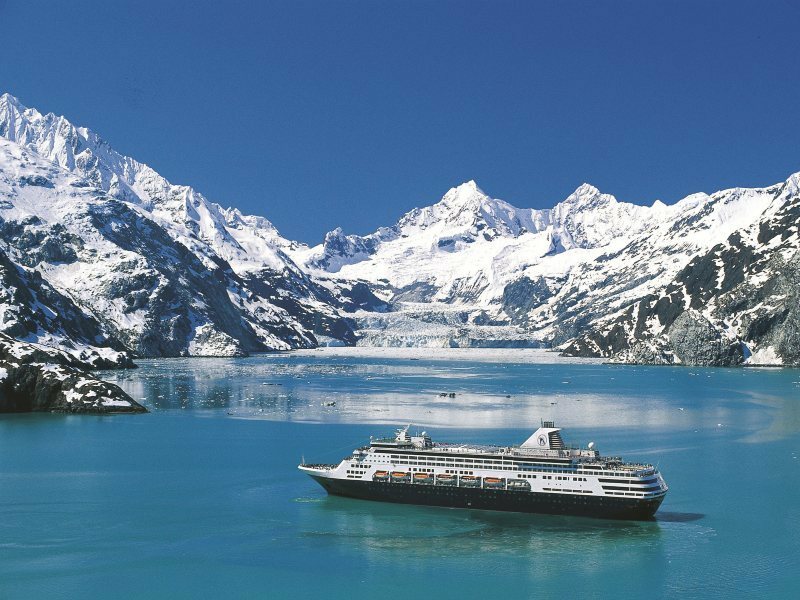 Today we’ll take a breathtaking cruise into Glacier Bay. Marvel at the ever-changing glacial seascape of this renowned UNESCO World Heritage Site where the silence is punctuated by the thunderous sound of ice splitting and crashing, in great chunks, into the water. The colourful town of Ketchikan, its wooden houses built over the water, is our last port of call. You will have the opportunity to join the optional shore excursion to the remote Misty Fjords National Monument, a vast wilderness reserve where some of Alaska’s most spectacular scenery can be found. On today’s optional guided tour of Vancouver you’ll discover restored Gastown, the kaleidoscopic thoroughfares of Chinatown, and the glass and steel wonders of the Burrard Inlet waterfront. You’ll also be able to explore the famous Capilano Suspension Bridge Park. Afterwards, explore at your leisure. Join an optional tour, sailing through the Gulf Islands to Vancouver Island where you’ll visit Victoria, the charming, colonial Provincial capital set around the beautiful Inner Harbour, as well as the world-famous Butchart Gardens.